Proper setup of a guitar depends largely on the correct positioning of the strings on the fretboard, which lie on two sills, upper and lower. The distance between the nut defines the length of the string and is called the scale of the guitar. Making a nut, you know that the top is near the head of the vulture at the top of the guitar. It depends on the setup strings and the resonance of the instrument. The lower nut located on the stand of the body of the guitar. Usually the factory tools are not the right kind of nut. So the guitar sounded nice and was able to build up properly, the nut will have to do yourself. Select the material of manufacture of the nut. You can use: metal, brass or Nickel (polished well, the strings resonate and sound great, but the material is difficult to machining); graphite (soft self-lubricating material available, easy to process, the strings sound smooth, chamber); artificial stone Corian (a solid material, synthetic, available, obedient to handle, the strings give a smooth balanced sound); bone (a traditional tool of solid material requires careful handling, the strings sound clean, bright). Perhaps a bone nut is the most preferable for all kinds of guitars. And although the nut blanks can be purchased in music stores, a bone nut will have to do yourself. Keep in mind that the treatment of bones is not very pleasant procedure, moreover, thoroughly stinking. Buy in store or slaughter a whole beef Shin bone with the joint. Do not buy already chipped the bone, as in the cabin of the inevitable cracks. Cut the bone on both sides with a hacksaw, leaving about 10 cm of the Central part. Get rid of the content of the hollow bone and the surface of the remnants of skin and meat. We split the bone in half lengthwise into two pieces, cut out the porous areas. Wash the workpiece detergent, usablity soft part of the flesh. To get rid of excess fat, vivaria bone in boiling water (bring to a boil, let cool, remove and dry it in the shade). Saw out blanks for the nut in the form of a small oblong parallelepiped. 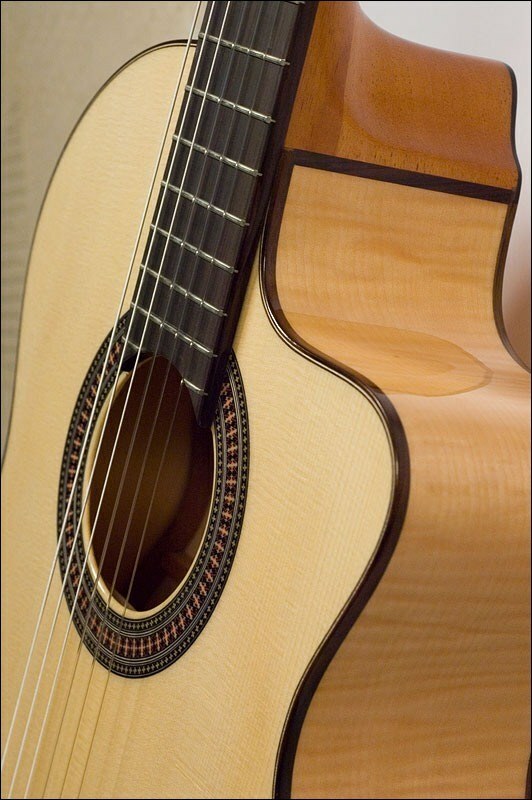 For the top nut: length equals the width of the fingerboard pad + 1 mm on each side; thickness – 5-7 mm; height equals the thickness of the lining + 2mm the Dimensions of the saddle will have to be set experimentally or be based on the factory option, but without the notches under the strings.